Peak climbing in Nepal is popular and challenging tourism activities which offers wide range of the Himalayan views ,Lush valleys , beautiful landscape . Nepal has been the focus of outstanding achievements in the world of mountaineering, with it's eight peaks above 8000 meters. It has challenged the minds and bodies of those who have dared for decades Among the identified 1310 peaks in Nepal above 6000 meter, one quarter are officially opened for mountaineering activities, including the ' Nepal trekking peaks' from Nepal Mountaineering Association and Nepal tourism board. Attempt these peaks is the next step beyond 'simply' trekking, before scaling the eight thousand. For the Nepal peak climbing every climbers /mountaineers should take permit from Nepal Mountaineering association and Nepal trekking or Travel agency should be member of NMA to obtain the peak permit through Nepal Mountaineering Association. The Nepal Mountaineering Association has designated : Group A NMA 15 trekking peaks and Group B NMA 18 trekking peaks ranging in elevation from 5587 m (Mardi Himal). 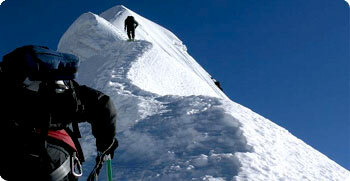 to 6654 m (Mera Peak - highest trekking peak in Nepal) as trekking peaks. For Group A NMA 15 trekking peaks permit cost 1-7 person group basis USD 500 and Group B NMA 18 trekking peaks permit cost 1-4 person group basis USD 350 . Nepal Mountaineering association determined Nepal peak climbing permit cost according to the group size but all the 33 peaks garbage deposit USD250 is required and refundable shall made as per provisions of NMA. Group A NMA peaks are Mt. Cholaste 6440m, Mt. Machharmo 6273m, Mt. Kyazo Ri 6186m, Mt. Phari Lapcha 6017m, Mt. Nirekha 6159m, Mt. Langsisa Ri 6427m, Mt. Ombigaichen 6340m, Mt. Bokta6143m, Mt. Chekigo 6257m, Mt. Lobuche west 6145m, Mt. Larkya peak 6010m, Mt. ABI 6097m, Mt. Yubra Himal 6035m, Mt. Chhukung Ri 5550m, Mt. Yala peak 5732m and group B peaks are Hinchuli 6441m, Singu Chuli (Fluted peak) 6501m, Mera peak 6654m, Kusum Kangru 6367m, Kwangde peak 6011m, Chulu East peak 6584m, Chulu West 6419m, Island peak ( Imja Tse) 6189m, Pachharmo peak 6187m, Lobuche east peak 6119m, Ramdung peak 5925m, Pisang peak 6091m, Tharpu chuli peak (Tent peak) 5663m, Khongma Tse (Mehra peak) 5849m,Ganja la chuli ( Naya kanga) 5844m, Pokhalde peak 5806m, Mardi Himal 5587m, Paldor peak5896m. Nepal trekking peaks offer a compromise between a standard trek and a full-on mountaineering expedition, ranging in difficulty from moderately steep glacier walks to technical, multi day rock and ice climbs previous climbing experience is not strictly necessary, but you need to be specially fit and able to cope with cold and stormy conditions. Himalaya Journeys Treks & Expedition offers you a special arrangement to bring you to the summit of all Nepal trekking peaks.